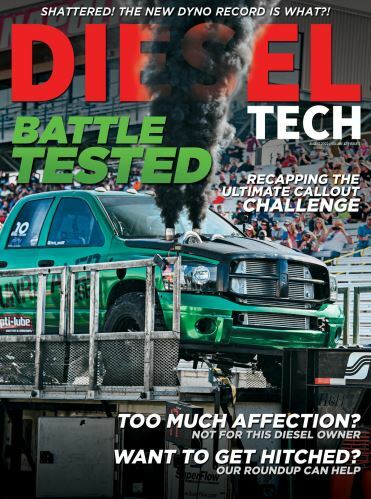 Rick Price drives a 2004 Dodge 2500 that he estimates is pushing around 800 hp to the ground. His passion for power started back in 2011 with just an aftermarket tuner and a diesel event in Montana. That was enough to get him hooked. With his first dyno run under his belt, Price was happy with just the fuel filter upgrade and tuner. At that point he says he was pushing 550 hp … not bad, but he wanted more. “My next upgrade got me a little more involved with the engine,” he said. “I needed to make sure I wouldn't pop the heads so I purchased ARP head studs.” He then thought, “Well, if I am going to do the head studs, lets go ahead an add some injectors.” So he installed a set of 100 hp Torque diesel injectors. So during the next event, Price was excited to see what kind of power he was pushing. Now, he explained, it starts getting fun. With the new turbos and lots of fuel the truck gets up and goes like a rocket. Running the new clutch, however, Price found out that the NV5600 has a weak point. “I ended up exploding the transmission,” he said. So after doing all the research and looking into the future plans for his truck, Price said he will next install a Fully Built Automatic 48re. The FASS Titanium Signature Series.